Sewage Sludge Treatment by anaerobic digestion is well established, and the challenge now is how to improve Water Industry AD plant performance. 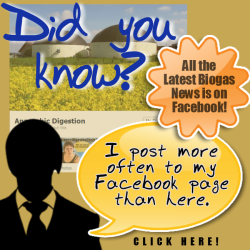 The news is that the Global Biogas Expo is where the AD industry will be exhibiting more ways to raise sewage sludge energy and wastewater electricity/ power output than ever before. In fact, our advice is that all water industry biogas plant professionals responsible for efficient biogas production at municipal wastewater treatment plants should be there. Featuring the very latest in biogas technology, this highly focused Expo, now in its ninth year, presents the water industry with the perfect opportunity to achieve its goal of energy self-sufficiency – with products and systems to increase the generation of renewable energy. 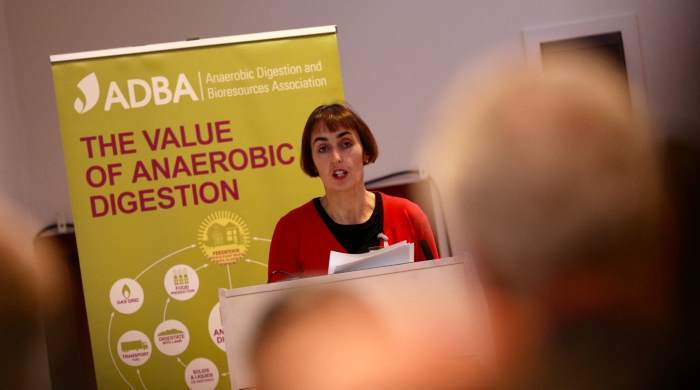 said Charlotte Morton, Chief Executive of the Anaerobic Digestion and Bioresources Association, who are organising the Expo in partnership with the World Biogas Association. Sewage sludge treatment describes the processes used to manage and dispose of sewage sludge produced during sewage treatment. Sludge is mostly water with lesser amounts of solid material removed from liquid sewage. Primary sludge includes settleable solids removed during primary treatment in primary clarifiers. Secondary sludge separated in secondary clarifiers includes treated sewage sludge from secondary treatment bioreactors. Sludge treatment is [historically] focused on reducing sludge weight and volume to reduce disposal costs, and on reducing potential health risks of disposal options. Water removal is the primary means of weight and volume reduction, while pathogen destruction is frequently accomplished through heating during thermophilic digestion, composting, or incineration. The choice of a sludge treatment method depends on the volume of sludge generated, and comparison of treatment costs required for available disposal options. Air-drying and composting may be attractive to rural communities, while limited land availability may make aerobic digestion and mechanical dewatering preferable for cities, and economies of scale may encourage energy recovery alternatives in metropolitan areas. Energy may be recovered from sludge through methane gas production during anaerobic digestion or through incineration of dried sludge, but energy yield is often insufficient to evaporate sludge water content or to power blowers, pumps, or centrifuges required for dewatering. Coarse primary solids and secondary sewage sludge may include toxic chemicals removed from liquid sewage by sorption onto solid particles in clarifier sludge. Reducing sludge volume may increase the concentration of some of these toxic chemicals in the sludge. The residue that accumulates in sewage treatment plants is called sludge (or biosolids). Sewage sludge is the solid, semisolid, or slurry residual material that is produced as a by-product of wastewater treatment processes. This residue is commonly classified as primary and secondary sludge. After thickening, the sludge is further treated to make it safer for the environment. The sludge is placed in oxygen-free tanks, called digesters, and heated to at least 95 degrees Fahrenheit for between 15 to 20 days. This stimulates the growth of anaerobic bacteria, which consume organic material in the sludge. Unlike the bacteria in the aeration tanks, these bacteria thrive in an oxygen-free or “anaerobic” environment. The digestion process stabilises the thickened sludge by converting much of the material into water, carbon dioxide and methane gas. The black sludge that remains after digestion has the consistency of pea soup and has little odour. This is called digested sludge. Methane gas is often used as an energy source at the City’s wastewater treatment plants. The gas may be used in engines to produce electricity or directly drive plant equipment. Gas is also used in boilers to provide heat for digestion and plant-wide buildings. Currently, DEP and the New York Power Authority (NYPA) have jointly installed fuel cells at four of the City’s water pollution control plants; 26th Ward, Red Hook, Oakwood Beach and Hunts Point. Fuel cells convert the methane gas and carbon dioxide into heat and electricity that is then used to operate the plants. This technology contributes to New York City’s efforts to enhance clean air operations at its facilities. There is a significant reduction in air emissions as a result of using fuel cells. It is also increasingly common to use anaerobic digestion processes in industrial wastewater treatment. I have made a biogas plant in a plastic tank. After 1 week when i open the gas not burn. What I do wrong. Greetings, There’s no doubt that your web site might be very good but why not burn sewage sludge by incineration? This is making much power. You do not explain this. I simply wanted to provide you with a quick heads up! Apart from that, great site! Awesome? I should certainly pronounce, impressed with this web site. I had no trouble navigating. I found what I hoped to fnd, you know it at all. Our focus groups focus on sustainable energy products. We are studying sewage sludge treatment at present. Your information has been added to our resource list. Will look out for more on this topic on your website in future.